The New York Times has one of those baffling editorials that abortion advocates must think is somehow persuasive to someone other than abortion advocates. Former Seattle City Councilwoman Judy Nicastro writes about her decision to have an abortion at 23 weeks while she was pregnant with twins. Some of the male's child organs weren't developing normally so she has an abortion to kill the male child even though it risks the life of the other child (who thankfully survived). Once we had all the data, we met with a nurse, a surgeon and a pediatrician at the hospital. The surgeon said our boy had a hole in his diaphragm. Only one lung chamber had formed, and it was only 20 percent complete. If our boy survived birth, he would be on oxygen and other life supports for a long time. The thought of hearing him gasp for air and linger in pain was our nightmare. The surgeon described interventions that would give our son the best chance of surviving birth. But the pediatrician could tell that we were looking for candid guidance. He cautioned that medical ethics constrained what he could say, then added, "Termination is a reasonable option, and a reasonable option that I can support." The surgeon and nurse nodded in agreement. I burst out sobbing. My husband cried, too. But in a sense, the pediatrician's words were a source of comfort and kindness. He said what we already knew. But we needed to hear it from professionals, who knew we were good parents who wanted what was best for our children. The next day, at a clinic near my home, I felt my son's budding life end as a doctor inserted a needle through my belly into his tiny heart. She had trouble finding it because of its abnormal position. As horrible as that moment was — it will live with me forever — I am grateful. We made sure our son was not born only to suffer. He died in a warm and loving place, inside me. So instead of actually trying to help her sick son, Nicastro tell herself the best thing for her children was to have an abortionist kill her son by injecting digoxin into his heart and risk the life of her daughter in the process. Truly bizarre. Also, shame on the medical staff for basically encouraging them to have an abortion. Later Nicastro reveals the lengths she'll go to in order to convince herself that having her son killed was right. Thankfully, Kaitlyn was born, healthy and beautiful, on March 2, 2011, and we love her to pieces. My little boy partially dissolved into me, and I like to think his soul is in his sister. This is from someone who describes herself as "not religious." 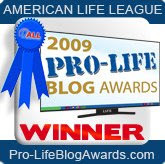 In fact, I asked if we could postpone the abortion until the third trimester, by which time my daughter would have been almost fully developed; my doctor pointed out that abortions after 24 weeks were illegal. So she wanted to have the decision to kill her son even after he was viable and then goes on to mark viability as crucial.